Welcome you intrepid In Stitches blog tour followers, welcome to my home on the web! 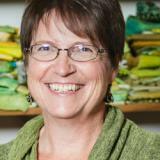 I want to tell you a little bit about my article in this jam packed issue of In Stitches. Conquering metallic thread is the topic...Metallic thread questions are the most frequent ones I get. 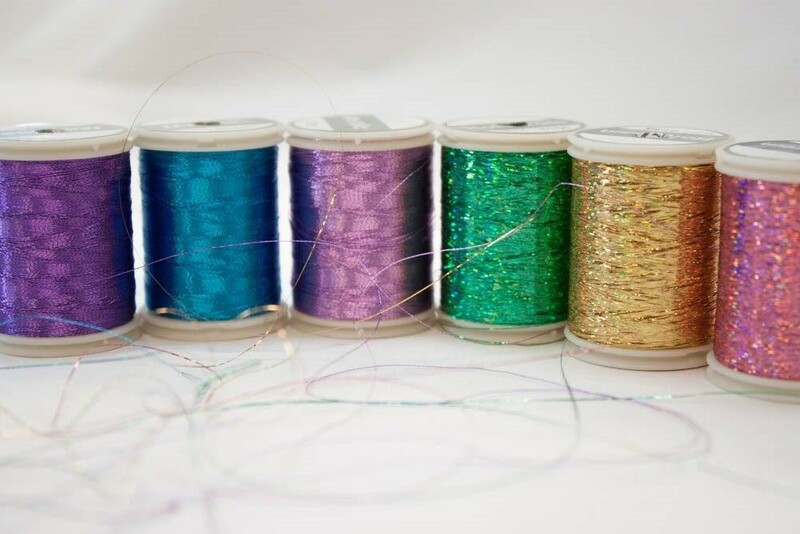 It is a finicky thread but with a few tips you can easily become a metallic stitch queen! Here are my top metallic thread tips! 1. The thread you use in the bobbin is important. I find that a fine(50-60wt) or ultrafine (70-100wt)polyester thread solves a lot of problems. Metallic threads are wiry and often not smooth so pairing them up with a soft drapey poly thread eliminates a lot of tension problems. 2. Speaking of tension...reduce it! The upper tension dial is one of your best and often underutalized tools on your sewing machine! Reducing the top tension (lower numbers) means less tension on the thread so it will be less likely to break. When I am free motion stitching with metallic threads I set the top tension to zero! 3. The needle...A metallic needle is handy but not necessary. Depending on the type of stitching you are doing a size 90 embroidery (for free motion) or 90 topstitch (programmed and straight stitches) work just as well. 4. Slow down. Sewing fast creates more friction on your thread and friction causes heat and increased force on your threads...causing them to stretch and break. In addition, when you are free motion sewing and moving the fabric fast you are adding stress/tension to the thread. So often in our daily errands we do things in a hurry; slowing down allows us to actually get into the zen of stitching and relax! 5. Thread delivery. Some threads just need a bit more time and space to relax before they hit those tension disks...wow...I could go down this philosophical path on how we would all benefit from more time and space before we face our own daily tension...but let's get back to thread! Try using a thread stand or a jar placed behind and away from your machine. Make sure the thread path goes no where near your fly wheel! Also make sure that the thread is coming off a stationary spool. Dragging the spool along as it unwinds adds more tension. 6. Know your stabilizers! Every thread fanatic should have a wide variety of stabilizers at their fingertips! Stabilizers can make your stitch world so much more beautiful and solve so many stitch problems...and you will have younger looking skin as well. Ok, just joking about the skin but seriously...get to know your stabilizers. They are so valuable in the studio! I wasn't sure if I would like an on-line magazine but was totally sold after I got the first issue of In Stitches! I love being able to zoom in on a photo, watch the videos...what a great way to get to know an artist! And, best of all I don't have to buy another book case to house all the back issues and we aren't using up our natural resources to produce them. GIVE AWAY! Everyone loves a giveaway and I have a wonderful one for you! The winner will receive a copy of Threads: The Basics and Beyond Debbie Bates and myself plus a packet of stitch goodies...including some metallic thread of course and some fabrics and some surprises! Leave a comment below and I will use a random number generator to pick a winner on Wed March 9th! Here is the entire blog tour schedule so you can learn more about In Stitchesand these awesome artists! Pssst...a lot of the other artists have give aways too!! I love prizes don't you?